I did, in 1978. Peyote actually. WillG, TravisR and dpippel like this. Yes I remember that vividly . I know I should post this on "streaming", but the supposedly HD only transfer opening logo in comparison with the Vudu HD opening logo. I think iTunes is 4K. 600 bucks for an autograph from Susanne Christiane? after all, "The play's the thing". It’s missing the book of frame enlargements from the film, and the script outline and script notes mini books, but has everything from the main book. Wow. It has quite a few negative reviews, complaint #1 being that the format of the book forces many of the beautiful images to be split down the middle across the spline. The photograph therefore becomes distorted, and some picture information is lost in the depths of the crease. Is this the case Josh? Also, the Amazon link you provided lists the edition as a hardcover, not a softcover. I bought the Taschen monolith book for about $35 on a special on Amazon UK - I am pretty sure it's the same as the expensive version, without bonus prints and packaging. Dave S.G., Todd Mattraw, Yohan Pamudji and 5 others like this. It's a nice book, and well worth having, but it would have been soooo much better if they had skipped the "monolith-dimensions" formatting. Too clever for its own good. CarlosMeat, SAhmed, ScottHM and 1 other person like this. I went ahead and ordered a copy to see for myself. I suppose I can return it if the issues are insurmountable for me. Yes, the formatting of the book is odd - they were determined to keep a monolith shape even though it makes for awkward reading. But that’s true of the $600 and $1200 editions as well. Frankly, I haven’t spent as much time with the book as I thought I would because the formatting makes it uncomfortable to read, and the text is a bit on the dry side. I’m glad I have it - but it’s not very practical. Thanks Josh. My copy arrives tomorrow, and I'm curious to see it first-hand. PMF and Josh Steinberg like this. Let me again plug Michael Benson's excellent book. I've not read Bizony's so I cannot offer a comparison. For those with ebook accounts with their public library, Benson's book is a no cost, no brainer loan. I learned more than a great deal about the movie from it. Josh, thanks for the info about the extended soundtrack. My copy arrived today. It's very nice. Benson’s book has a few minor factual inaccuracies that ultimately don’t matter, but other than that very slight flaw, it’s a genuinely entertaining look at the film’s production - I highly recommend it. In many ways, it’s the book I always wanted to write but never did. 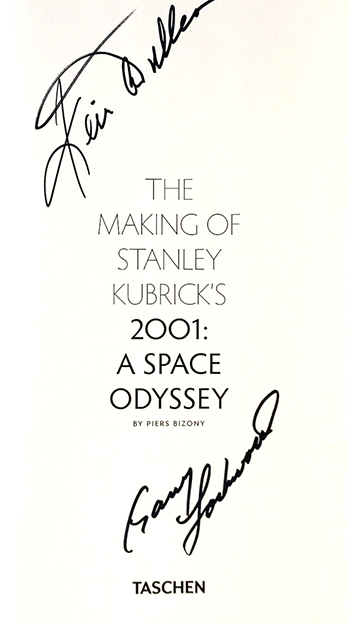 I visited the Kubrick Archive almost a year before the Benson book came out and looked over a lot of “2001” related material. I can tell reading the book that he did the same. There are some things he mentions where when I was reading the book I knew exactly what he was referencing and had held that very paper in my own hands. The fade out, which should be 64 frames, is missing. At that length, one would see the glass touch the table, as it’s only a dozen or so frames into the fade. The Fade in has been encoded, but may stay in black too long. On the 2007 Blu-ray I'm counting 14 frames of fade out, followed by 94 frames of black (I might be a frame or two off), then 23 frames of fade in, so it appears the fades may not be correct there either. The only other fades I can think of are the fade out just before "JUPITER AND BEYOND THE INFINITE" which I'm counting as 18 frames, and at the end which I'm counting as 26 (also 2007 BD). I'm probably missing one or more somewhere. I've also recently read elsewhere on the internet that "2001" did not have "true" 6 channel sound, but that it had a “spread” mix with tracks 2 (Le) and 4 (Re) containing only blends of the adjacent channels. That might be supported by the mention of three-track 35mm magnetic master of the Alex North score mentioned in the Jon Burlingame article. Would there even have been three track recordings of all the pre-existing music that was used? I think it would be interesting to know more about this as it should relate to the results heard on the "original theatrical 6-track audio mix formatted for 5.1" track that is included on this release. I was told that the entire film was a 4-track mix, with the exception of the final reel, which was 6, and mixed in Hollywood, as opposed to London. For what it’s worth, Lawrence was also 4-track. PMF, B-ROLL, Josh Steinberg and 1 other person like this. Everything I’ve ever come across has said the same as well. When you play the original 1968 version of the audio why does the announcement about the cashmere sweater not come from the surround channel as it did in the original 1968 prints and the 1978 reissue. I'll also highly recommend Benson's book - I read it a few months ago and it was incredibly comprehensive and as good as the JW Rinzler's books on the making of the original Star Wars trilogy. 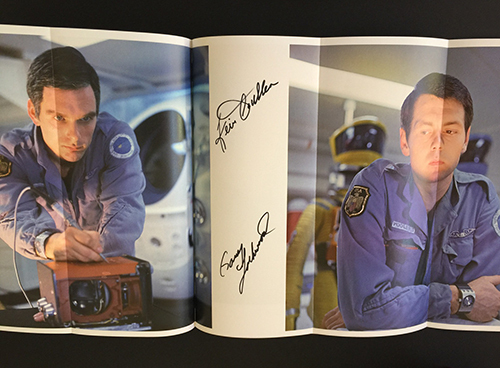 It was especially interesting reading some of the original dialogue between HAL and Dave when Dave is killing him. Benson also provides excerpts from the movie's original narration, which would have clarified/demystified a lot of what happens in the movie. Dave S.G. and KeithDA like this. Mr Harris, perhaps you will fill out the survey card? My copy also came with this insert and a code, but I haven't had any luck accessing the survey. Is anyone else having trouble?